First announced in February at Embedded World 2018, NXP Semiconductors has released its i.MX RT1060 Crossover processor, with the company claiming a mere ten months from concept to market launch. 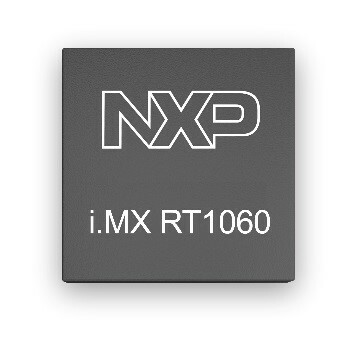 The i.MX RT1060 is the latest addition to what NXP calls a crossover processor series and expands the i.MX RT series to three scalable families. The i.MX RT1060 doubles the On-Chip SRAM to 1 MB while keeping pin-to-pin compatibility with i.MX RT1050. This new series introduces additional features ideal for real-time applications such as High-Speed GPIO, CAN-FD, and synchronous parallel NAND/NOR/PSRAM controller. The i.MX RT1060 runs on the Arm Cortex-M7 core at 600 MHz. The i.MX RT crossover are designed to bridge the gap between high-performance and integration while minimizing costs to meet today’s need for high performance embedded processing at the edge node. According to NXP the series were designed to combine high performance MCU processing with the functionality of applications processors, at reduced costs, thereby enabling advanced computation and machine learning capabilities in millions of connected edge devices. The i.MX RT1060 is available now, and is priced at $3.48 (10,000s). This entry was posted in Industry & Enterprise, Product News and tagged ARM, CAN bus, edge computing, MCU, microcontrollers, processors by Circuit Cellar Staff.